John McCain is being called an American hero today—a title that he very richly deserves, but not anymore today that he has any day over the last 50 years. 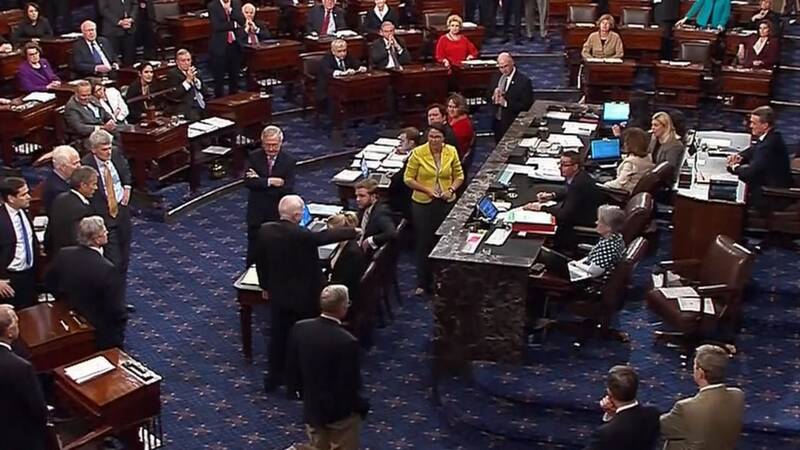 John McCain votes to the sounds of gasps on the Senate floor. He earned the title hero wearing our nation’s uniform, being brutalized and held captive by an enemy government for 5 ½ years. While some “like people who weren’t captured,” every decent, good-hearted American can agree that John McCain earned a place in the pantheon of American heroes with his service, his fortitude, and by his willingness to sacrifice his life for our country. Since returning home in 1973, no matter what he’s done politically, whether you agree or disagree, whether you voted for him or not, one fact has never changed—John McCain has always done what he believes is the right thing. While McCain’s actions on the Senate floor in today’s early morning hours don’t rise to the level of heroic, they do make him Washington’s current finest example of a public servant. This is a man sick—perhaps dying—who pulled himself together, put on a suit, hopped on a plane, and spent some of what could be his last days alive trying to make government work for all Americans. When that work came up short, he consulted his conscience and made a choice—perhaps with the knowledge that it was the last choice he’d ever make on behalf of the American people. The fact that his vote caused audible gasps in the chamber only proves that this came from a place deep within this person. He cast away politics to do what he thought was right. Isn’t that what we all say we want in a politician? Someone who will work tirelessly to come up with something that will be of benefit for the people, but also someone who will stand by his principles when something doesn’t pass the smell test? Healthcare is a mess in this country—mostly because we, as Americans, know what we don’t like just fine—but can’t pick a direction going forward. John McCain’s vote forces everyone to get together and come up with a healthcare law that is not about political victory, but about the health and wellbeing of the American people, and maybe something that won’t get scrapped when the leaders change again in Washington. I don’t think it makes him a hero, but it might be as close to heroic as a public servant can be.